Color, texture and pattern. If you break it down and look close, it’s really just that. However, step back and allow yourself to be drawn into the landscape for a more personal experience. My stylized landscapes are images created from my mind. They are an exaggeration of reality with overly saturated colors meant to magnify the beauty of the wonderful lands we’re surrounded by. Talent, complimented by a passion to create, sums up Chris Rankin. He has been creating “stuff” since his parents first gave him the various tools to do so. As a child, anything he could get his hands on was fair game to be part of his creative exploration, whether it was balsa wood, a crayon or oil pastel. If it could be drawn, painted, nailed, molded or glued together something fun was going to be created. Fifteen years later, Chris moves to Columbus, Ohio and gets a BFA from the Columbus College of Art and Design. And now, 20 years after CCAD, Chris finds himself interested in two new tools as part of his creativity: beeswax and fire. Two of the most natural substances know to man.Â Encaustic, as it’s called, dates back to early Egyptian times and is one of the oldest forms of painting know to exist. 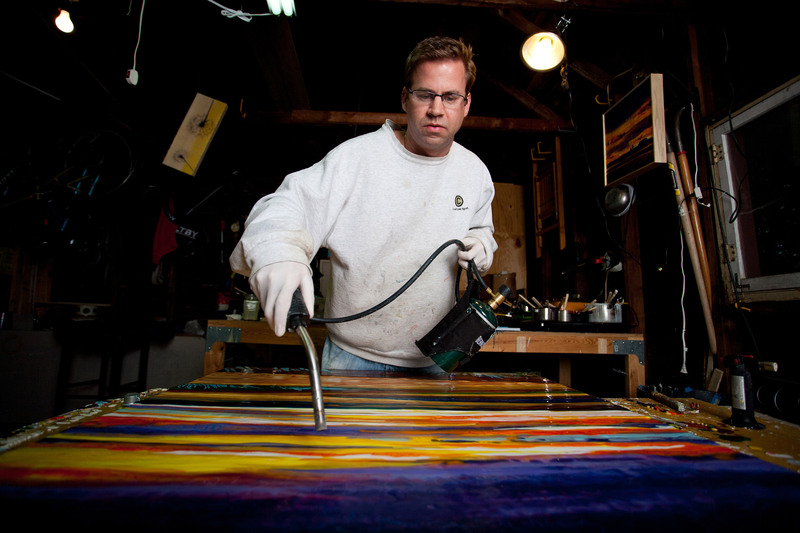 The technical definition of encaustic is: using pigments mixed with hot wax that are burned in as an inlay. About eleven years ago Chris started exploring the encaustic medium, enjoying the versatility and freedom to work in a variety of styles and techniques. Chris finds encaustic a great medium to work with because he’s exposing this unique medium to people for the first time in most cases.Â His recent works are stylized landscapes representational of the beautiful rolling fields that surround our region.Â Chris is an active participant in the thriving arts community of Central Ohio, served on the Board of Directors for the Ohio Art League for three years and displays his work throughout Central Ohio.